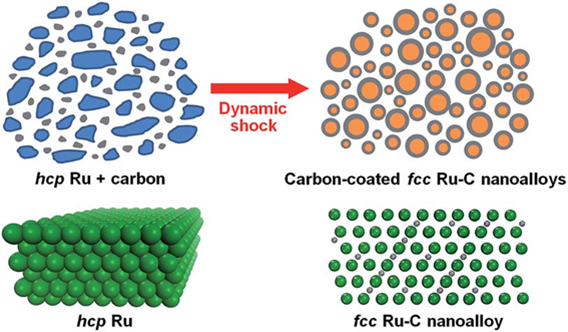 A research team including Carnegie's Zhisheng Zhao has reported the synthesis of a new nanocatalyst, the carbon-coated face-centered cubic (fcc) ruthenium-carbon (Ru-C) nanoaloy produced by an explosion shock method. In this current research, ruthenium was mixed with carbon powder by ball-milled method and an explosive-driven flyer used to impact the mixture. The researchers discovered that the ruthenium and carbon mixture becomes a solid sollution alloy, fc Ru-C, coated with carbon (core-shell structure). The recovered nanocatalyst showed significantly high thermodynamic and chemical stabilities. The increase in the activated electrons at the Fermi level and the redistribution of electric charges among atoms can significantly enhance material's catalytic activity and selectivity [Z. Zhao et al., Nanoscale DOI: 10.1039/C4NR02632B (2014)].